The seventh annual Honoring Our Veterans and First Responders Pow Wow is set for Saturday and Sunday, Aug. 18-19, at the Shelby County Fairgrounds. The event highlights the Native American community in honoring veterans and first responder personnel. Native American dance, crafts and food will be available. The event is free and open to the public. 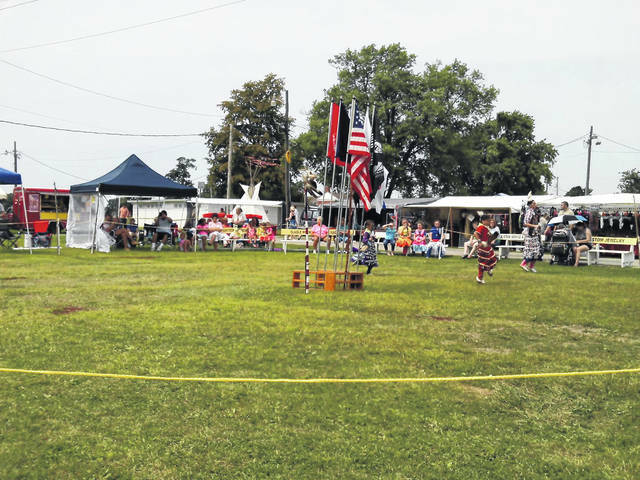 SIDNEY – The seventh annual Honoring Our Veterans and First Responders Pow Wow set for Aug. 18-19 at the Shelby County Fairgrounds will present a variety of Native American aspects of life. Events begin at 10 a.m. each day with presentations closing at 9 p.m. Saturday and 5 p.m. on Sunday. The Pow Wow is free and open to the public. Visitors are urged to bring their own chairs and shade, if possible. Food venders will be available, and donations will be accepted to offset expenses. George Reiter, of Cincinnati, is a co-organizer along with family and friends. He said the event honors veterans and educates visitors to the involvement of Native Americans in military service. Reiter, who is not Native American, is a Vietnam War veteran having served in Korea. He, his wife, Shirley, and his son, Juan, have joined with Mary and Tammy Chambers to plan the weekend. The goal to establish a Pow Wow in the area was the idea of the late Martin Tall Tree of Piqua, a Native American and Vietnam vet. Tall Tree passed away on Memorial Day in 2011. His family joined the Chambers’, relatives of Tall Tree, to continue the dream, Reiter said. Juan Reiter holds the position of the Pow Wow’s Head Man and will perform a Native American dance on Saturday. Reiter said several local organizations will be coming together for the event. Officials of the local VFW Hall, Amvets and American Legion will be on hand. First responder vehicles from the Sidney police and fire departments along with the Shelby County Sheriff’s Office will be on display. Sidney Mayor Michael Barhorst will address the crowd along with an official from the Dayton Veterans Administration. A letter from officials at Wright-Patterson AFB will be reading during the ceremonies. Reiter said the event will be a family friendly atmosphere and stated no alcohol, carrying of weapons, or making public political statements or demonstrations will be permitted. Native dance and Indian crafts will be held throughout the weekend. Two drummers will be on hand as will performers, The Southern Singers and Blue Heron. Various food vendors will offer Buffalo burgers with Navajo Taco, a food vender from a reservation in New Mexico will be on hand. Reiter said the Pow Wow will be part of a busy fairgrounds with annual horse and goat shows also being held. The Sidney Junior Fair 4-H group will also be holding a rummage sale and serving as a food vendor for the Pow Wow. For more information, contact George Reiter through his Facebook page.